The next pipe in the queue came from a pipe that Jeff purchased from a fellow in New York who picks up some nice pipe for us on his “treasure hunting adventures”. 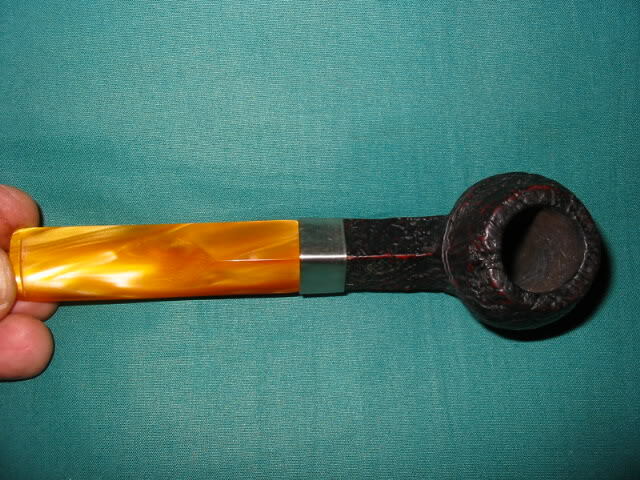 This one was a Pipa 2005 Savinelli Made bent billiard. It is stamped on the underside of the heel and shank and reads Pipa 2005 over Savinelli Product followed by Italy. 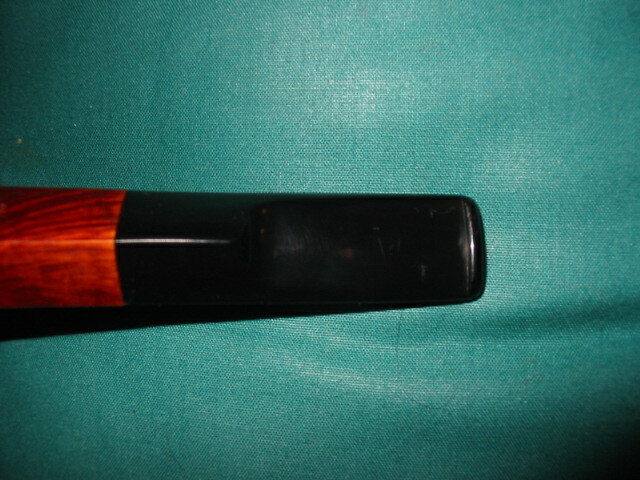 It is a bent billiard shaped pipe with a flat bottom on the heel and part way up the shank. With the stem it is too heavy to be a sitter but it is a beauty. The finish looks sandblasted but upon observation it was rusticated before sandblasting. It is what I call a “blasticated” finish. The rim top was smooth and had a beveled inner rim edge. There was some light tars and oils on the bevel and rim top. The pipe was dusty but the finish looked like it was rich and would clean up well. The stem is striated grey Lucite saddle with a polished brass spacer as an integral part of the stem. There is a Savinelli Shield S on the top of the saddle. The stem has some light tooth marks and chatter on both sides at the button edge. The photos below tell the story and give a glimpse of the pipe before clean up. Jeff took photos of the bowl and rim to show the condition of the pipe before he started his cleanup work. There was a light coat of lava on the bevel and rim top toward the back side and a thin cake in the bowl. It appeared that the beveled inner edges were in good condition. The outer edges actually appeared to be in excellent condition. He also took a photo of the right and underside of the bowl and shank to show the “blasticated” finish on the bowl and the smooth panel on the underside. The dark and medium brown stain looked really good. Jeff took photos of the stamping on the underside of the shank and the Savinelli Shield S on the stem top. It reads as noted above. The stamping is legible and very readable. The next two photos show the stem surface. They show the light tooth marks and chatter on both sides near the button. The stem is otherwise clean. Once again, Jeff did his usual thorough clean up job on the pipe so that when it arrived here in Vancouver it looked really good. Jeff reamed the bowl with a PipNet pipe reamer and followed up with a Savinelli Fitsall pipe knife to remove the cake. He scrubbed out the mortise and the airway in the shank and the stem with alcohol, cotton swabs and pipe cleaners. He scrubbed the exterior of the bowl, rim, shank and stem with a tooth brush and Murphy’s Oil Soap to remove the oils and tars on the rim and the grime on the finish of the bowl of the pipe. He rinsed it off under running water. He dried it off with a soft cloth. 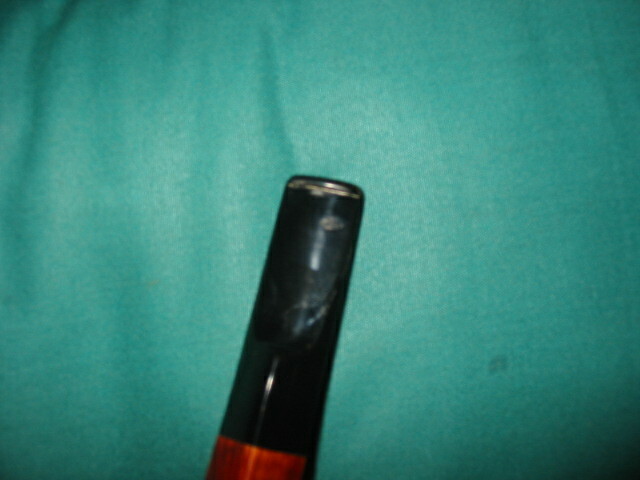 He was able to remove all of the lava build up on the beveled rim top of the pipe. The rim top looked very good. The grain was beautiful and the pipe looked new. The stem looked very good with its striations of silver and grey with some light tooth marks and chatter. Overall the pipe looked almost new. I took photos of the pipe to show its condition before I started my work. I took close up photos of the bowl, rim and stem surfaces to capture the condition of the pipe before I started my simple restoration of the pipe. The rim top was clean and the beveled inner edge was in excellent condition. The stem was quite clean with some light tooth marks and chatter on the top and underside near the button. The tenon was Delrin and drilled out for a 6MM or a Savinelli Balsa filter system. I took a close up photo of the stamping on the bottom of the bowl. It read as noted above in the earlier paragraphs. The rim top was in excellent condition so I polished it with 6000-12000 grit micromesh sanding pads. I wiped it off with a damp cotton pad after each sanding pad. I worked some Before & After Restoration Balm into the surface of the briar with my fingertips to clean, enliven and protect it. I worked it into the grooves with a horsehair shoe brush. I let the balm sit for a little while and then buffed with a cotton cloth to raise the shine. The following photos show the bowl at this point in the restoration process. The bowl and the rim top look really good and the grain really stood out on the smooth rim. The finish looks very good with the combined dark and medium brown stain on the bowl and rim. I sanded out the tooth marks with 220 grit sandpaper and then started polishing the stem with 400 grit wet dry sandpaper. I was able to remove all of the scratches and tooth marks and chatter from the surface of the stem. I polished the stem and brass spacer with micromesh sanding pads – wet sanding with 1500-2400 grit pads and dry sanding it with 3200-12000 grit pads. I wiped the stem down with a damp cloth after each pad. I further polished it with Before & After Pipe Polish – both Fine and Extra Fine. Since I had finished both the bowl and stem I put them together and polished the stem lightly with Blue Diamond polish on the buffing wheel. I gave the bowl multiple coats of Conservator’s Wax and the stem multiple coats of carnauba wax. I buffed the pipe with a clean buffing pad to raise the shine. I hand buffed it with a microfiber cloth to deepen the shine. The pipe polished up pretty nicely. The smooth rim top and the “blasticated” finish on the bowl really looks good polished and buffed. The rich dark brown was polished off the high points on the briar and works well with polished striated silver and grey Lucite stem. The finish on this pipe gives it a great feeling pipe in the hand and I am sure that it will be an amazing smoker. Have a look at it with the photos below. The dimensions are Length: 5 1/2 inches, Height: 1 3/4 inches, Outside diameter of the bowl: 1 1/4 inches, Chamber diameter: 3/4 of an inch. I will be putting this beauty on the rebornpipes store shortly and it can be added to your collection. 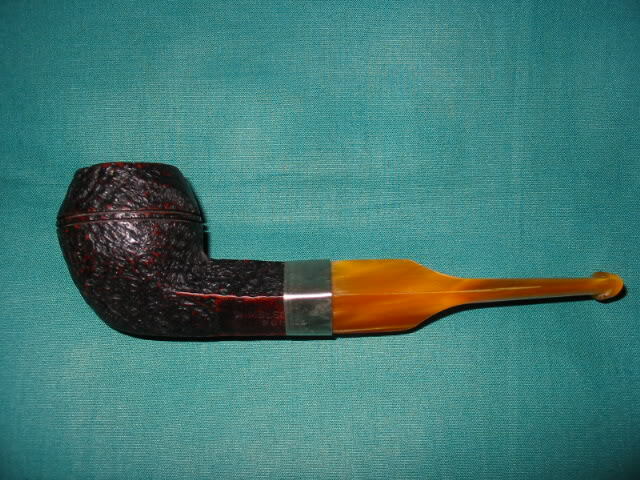 Thanks for walking through the restoration with me on this Savinelli Made Pipa 2005 Bent Billiard. This entry was posted in Pipe Refurbishing Essays and tagged Bowl - finishing, Bowls - refinishing, buffing, finishing, Lucite stems, micromesh sanding pads, Pipa Savinelli Product Bent Billiard, pipe refurbishing, polishing, polishing a stem, Polishing Lucite stems, polishing stems, refurbishing, removing tooth marks, sanding a stem, Savinelli Product Pipa 2005 Bent Billiard, Savinelli Product Pipa Bent Billiard Filter pipe, Savinelli Product Pipes, stem work, waxing, waxing a stem on March 11, 2019 by rebornpipes. I have this old bulldog in a box to be repaired for quite a while. 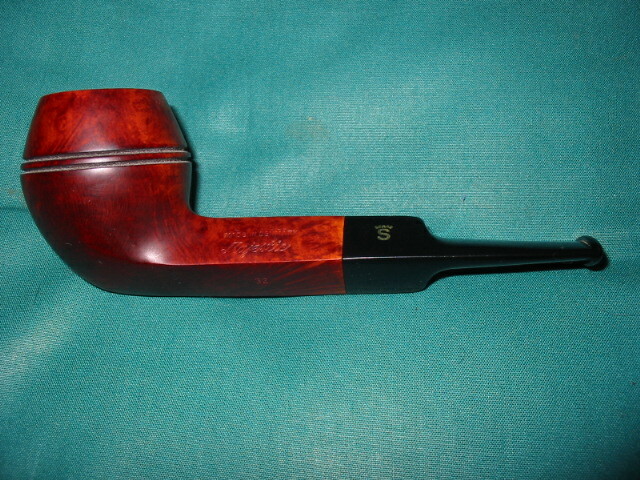 It is stamped Wimbledon 800 and from research appears to have been made by Briar Craft/Grabow. It needed a new stem as it came to me without one. I had this interesting old butterscotch coloured Lucite stem in my can of stem. It was a diamond shaped saddle stem that I fit to the bowl. I had to turn the tenon to get a fit on the bowl and then had to remove much of the Lucite material on the sides of the diamond shape and thin down the blade and button of the stem. I used my Dremel with a sanding drum to cut away most of the material on the angles and also flatten and thin the stem. I shaped the stem until the angles were correct and then finished the shaping of the stem with sandpaper. I used a medium grit emery cloth to start with as it seems to work really well in removing material and getting rid of the deep scratches and grooves left by the sanding drum. I then used 240 grit sandpaper followed by 400 and 600 wet dry sandpaper with water. I finished by polishing the stem with 1500-600 grit micromesh pads. I had to band the shank as it had a small crack near the top left edge. I fit the stem and then buffed the pipe lightly with White Diamond and then coated the stem with carnauba wax and the bowl with Halcyon II wax. I buffed it to a shine with a flannel buff. 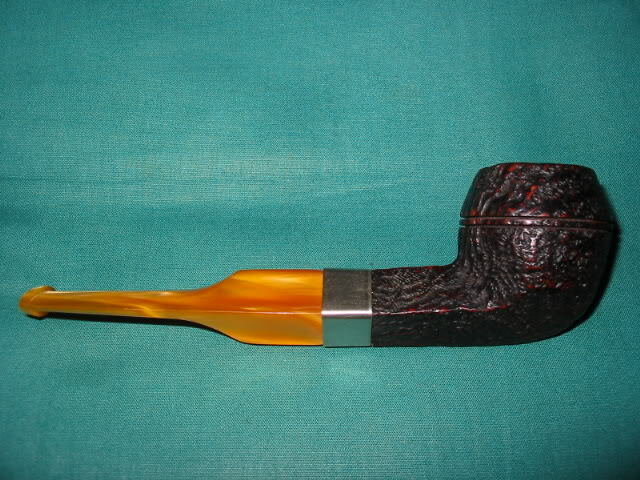 This entry was posted in Examples of Refurbished Pipes and tagged banding, Lucite stems, refurbishing, restemming on August 21, 2012 by rebornpipes. A normal pattern of behaviour for me in my refurbishing work is that once I figure something out that works on one kind of material I want to try it on a variety of similar items. In this case once I had used the heat gun to lift the tooth dents on a vulcanite stem I wanted to experiment with Lucite stems. I had no clue whether it would work or even if Lucite had some kind of memory that would bring the dents back to a smooth surface on the stem. There was only one way to find out since I could find no answers online and that was to give it a try. I figured the worst that could happen if I was careful was that the stem would remain the same – dented or a bit melted and I would have to do a different kind of repair. I had a nice little Stanwell bulldog that was given to that had a Lucite stem that had some tooth dents in the stem – just ahead of the button. There was one dent on top and one underneath. The two pictures below show the depth of the marks (Again I ask your forgiveness the poor quality of the photos, several of them are a bit blurry but I think that they give you a good idea of the nature of the problem. The dents look far worse in person than the pictures show). The top photo shows the top of the stem and the second photo the underside. I decided to continue my experiment with lifting the tooth dents with my heat gun on this Lucite stem as it seemed like a good candidate for the trial. I personally like working with a clean surface when I am doing this kind of work so I scrubbed the tip to clean it of any grime or grit that might be in the dents. I used a soft cloth dampened with Isopropyl alcohol to clean the surface then I buffed it with a quick light touch on a White Diamond wheel. The pictures below show the stem just before I used the heat gun on it. 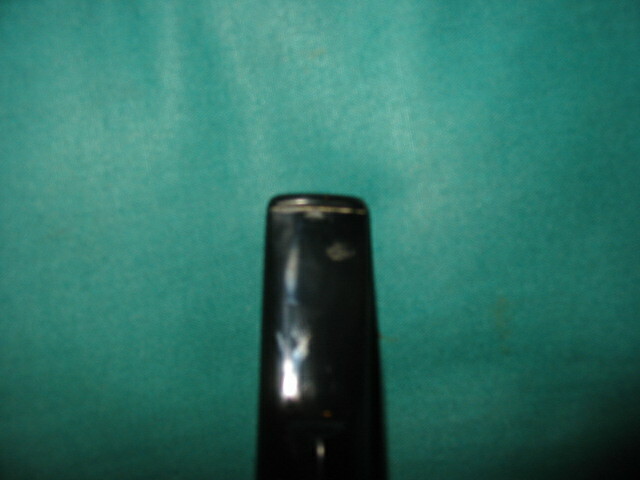 You will see in the photos that there are small pits close to the button as well as the larger dents on both sides. 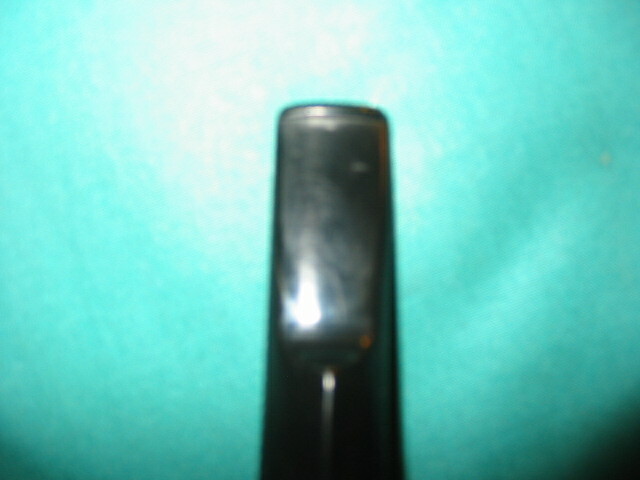 The crevice between the button and stem body also has some scratches that would need to be sanded out once the tooth dents were dealt with. As I explained in the post on the vulcanite stem I once again stood the heat gun on its end pointing upward. I used the wire stand built into the handle to stabilize the gun in this position (see the picture previous post on lifting tooth marks from vulcanite). I wanted to be able to have both hands free to maneuver the stem over the heat so having the gun positioned in this manner allows me to do that. I set the heat gun on low heat as before because I did not know how the heat would affect the Lucite. I have found that high setting can too easily burn the vulcanite so I was assuming the same thing would be true of the Lucite. I worked the stem over the heat keeping it about 4-6 inches above top of the gun tip as it allows it to thoroughly heat the Lucite. I move the stem constantly back and forth across the heat. I kept the stem on the pipe as before and used the bowl as a handle. In this instance I worked to just keep the first 3/4 inches of the stem from the button forward in the heat. I stopped frequently to check on the progress and see if there was any blistering on the stem. It took a bit longer for the heat to work on the Lucite. I think it must be the density and hardness of the Lucite that makes the difference. With the application of heat the Lucite began to return to its original smoothness. I kept the heat on the stem until all the dents were gone. The reason I believe the process worked was because the dents in the Lucite were not cuts in the surface but actual dents. The application of the heat did the trick. Once the surface was smooth I took it off the heat and cooled it the same way I did the vulcanite. I did not want the stem to bend accidentally while it was soft so I dipped the tip in some running cool water to set the new surface. I dried off the tip and then sanded the area with 400 and 600 grit wet dry sandpaper (with water on the stem as I sanded) and then moved through the grades of micromesh pads – 1500, 1800, 2400, 3200, 4000 and 6000 grit. By the 3200 grit micromesh pad I found that the Lucite was beginning to have a smooth and glossy finish. The sanding with the final two grades of the pads really polished the stem and gave it the glassy finish that polished Lucite has. I finished by giving it a final polish on the buffer with White Diamond polishing compound and a coat of carnauba wax. Here are some pictures of the top and the underside of the finished stem. This entry was posted in Pipe Refurbishing Essays and tagged acrylic stems, heat gun, lifting tooth dents with a heat gun, Lifting tooth marks, Lucite stems, repairing tooth dents, repairing tooth marks, stem work on June 9, 2012 by rebornpipes.